At the end of the street where I was staying with my uncle was the Boiling Crab. 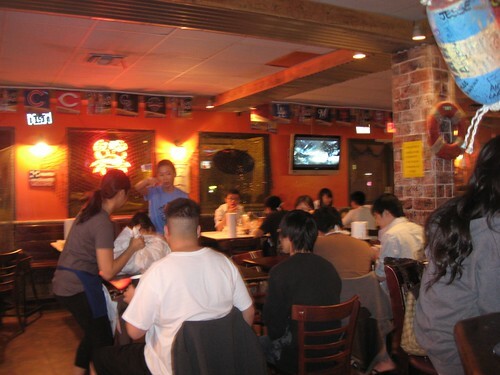 Supposedly, the Boiling Crab is a chain specializing in Cajun food, owned by Vietnamese people. The idea of trying crawfish was so exciting to me! I had crawfish in Louisiana, but it was in an étouffée or fried. I had never had it just boiled in massive quantities and this idea really appealed to me. But have you ever been so excited about trying something and the experience disappointed you? Unfortunately, this did. I forgot to take a picture of the exterior even though I saw it every day! As you can see from the picture above, this place was packed. In fact, on every evening, there were lines waiting outside the restaurant. If anything, this heightened my excitement. I called in for my order: 2 lbs of crawfish with medium spicy rajun cajun seasoning and an order of fried catfish ($8.99). I was warned that the medium spice level was quite spicy. Being confident in my heat tolerance, I decided to stick with medium. Big mistake! 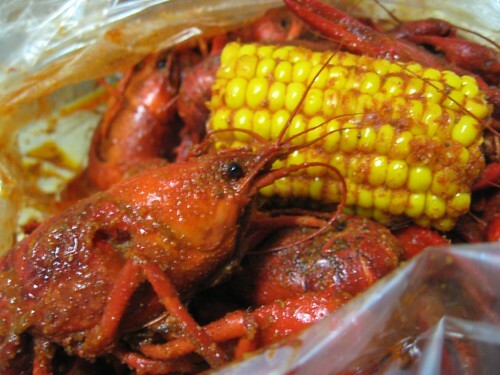 Crawfish with the complementary piece of corn for every 2 lb order. When I went to pick up my order, I saw tables covered with plastic and big piles of crawfish shells. I came home and was so excited to start chowing down crawfish. My aunt showed me how to eat a crawfish. First, you need to break off the head and then you pull out the tail. Unfortunately, after all this effort, I was rather disappointed to see the small amount of meat I would get. In addition to this, the seasoning was so spicy that it was really hard to enjoy. I couldn't even tough the corn. Finally, it was such a messy endeavour that I just lost all of my excitement. 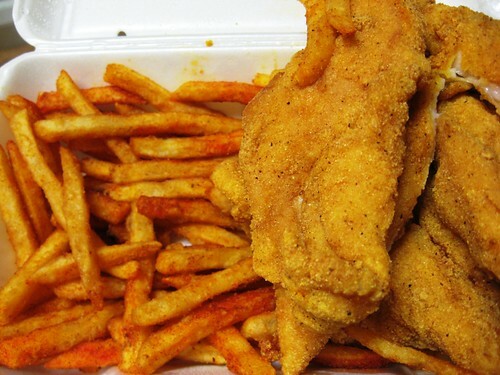 Fried catfish and cajun fries. The catfish wasn't as disappointing. However, by the time I got to the fried fish and fries, it wasn't quite hot and crispy enough to fully enjoy. I think this is a better dish to order when you're at the restaurant. My disappointment had nothing to do with the restaurant. I just don't think eating boiled crawfish is for me. Eating crawfish isn't for me either! So much work, so little meat!